First Line: Paul Davidson was stopped on the overpass outside of Denver International Airport, amused as always by the statue of the great blue Gumby horse rearing against the white peaks of the terminal roof in the background. Paul Davidson has sent his wife, Anna Pigeon, off on an autumn canoe trip in upstate Minnesota. With Anna are her friend Heath, a paraplegic; Heath's 15-year-old daughter, Elizabeth; Leah, a wealthy designer of outdoor equipment; and Leah's 13-year-old daughter, Katie. For Anna, it's a time to relax and recharge. For Heath and Leah, it's time to test cutting-edge camping equipment designed for the disabled. On the second night out, Anna goes off on a solo float down the Fox River. When she returns, she finds that four heavily armed men have taken the other four females hostage. Anna has extremely few resources and absolutely no access to the outside world-- and she's got two days to rescue her friends before they are either killed or flown out of the country. No one can put five females and an old dog out in the middle of nowhere, make them face untold danger, and have readers clapping and cheering like Nevada Barr can. Sure this is a thriller. Of course, it's an adventure story-- women against killers and nature. Naturally Anna Pigeon gets to impart valuable information on responsible camping, and you'd better believe that much-needed comic relief is interspersed throughout all the deadly seriousness. But Destroyer Angel is more than the sum of its parts-- and its descriptions. This book succeeds as both thriller and adventure story, but what makes it special are the women. Unarmed, with no food, and a gargantuan task ahead of her, Anna goes feral in an attempt to get the job done. Introduced in an earlier book, I was happy to see the changes Heath and her adopted daughter Elizabeth have undergone. Peppering up the gumbo are Leah, a woman more used to living in her mind than dealing with humans, and her spoiled daughter Katie. The interactions of the four kidnapped females are fascinating as they go through the various stages of fear, hunger, and exhaustion. Can they rise above being mere victims? I'll leave that for you to discover. 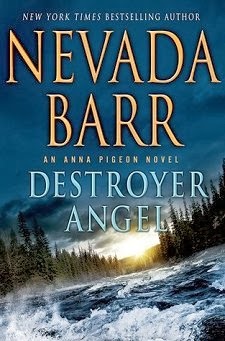 If you've never read Nevada Barr, you can read Destroyer Angel as a standalone because it is pretty complete on its own; however, longtime fans of the series are really going to savor Anna's tactics since we know her from earlier books. This was a book I had to tear myself away from forcibly. The second time I sat down with it, I stayed glued to the pages until the end. Welcome back, Anna! I missed you! Cathy - Yes, I'd say that it'd be hard for anyone but Nevada Barr and Anna Pigeon to carry off this sort of plot. She (Barr) is so skilled at weaving in nature with character development and plot lines. Glad you enjoyed this. I'm a Nevada Barr/Anna Pigeon fan, though I'm four books behind the current release and I cannot read them out of order! This sounds like a classic setup, and I'd bet on Anna over four heavily armed men any day of the week. What I like about these books are the psychological analyses that Barr includes--they're not just action mysteries, but thoughtful as well. I better get reading so that I can enjoy this one. Wow! So glad this is an excellent read. I have not missed an Anna Pigeon adventure yet since she left my city in search of the Great Outdoors and adventure, and where crime always finds her. Can't wait to get my hands on this one. It's on reserve at the library. I look forward to staying up all night with this book. You probably will stay up all night, Kathy. I had to stop reading it at one point, and it was a wrench for me to do it. When I sat down with it again, I vowed nothing was going to interrupt me until I'd finished!